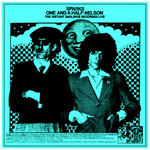 ‘one and a half nelson’ is probably one of the best known sparks live recordings. recorded at Croydon U.K, 9th of November 1975. Sparks lineup was as followed : Russell Mael on vocals, Ron Mael on keyboards, Norman “Dinky” Diamond on drums, bassist Ian Hampton (replacing Martin Gordon from the “Kimono My House” sessions) and guitarist Trevor White. The sound quality was fine – just a little bit of phasing in the beginning – but the record was really cheaply packaged (in the 70s’ most bootlegs were poorly annotated with photocopied covers). The album sleeve was a two colour paper insert slipped under the shrink wrap that enclosed the plain white cardboard album cover. The sheet featured a crude greeny xerox art with a photo of the Maels from the “Kimono My House” Lp inner sleeve with a hand-written track listing at the bottom. The disc got plain white blank labels. 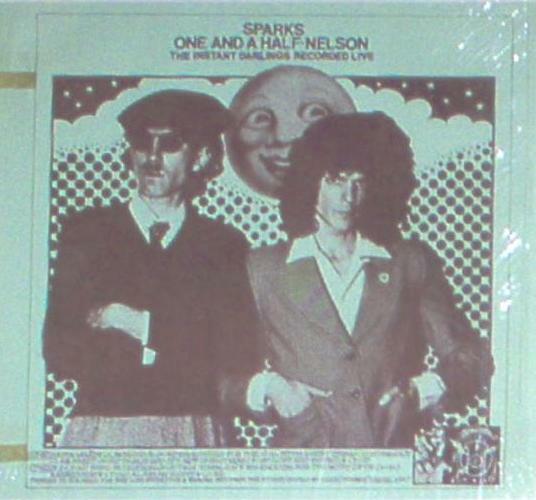 Sparks’ “One And A Half-Nelson” record was a really scarce – and rather expensive – item and it obviously became the “Holy Grail” for Sparks die-hard fans. It was extremely hard to find but was the perfect way for fans to listen to versions of songs for which live recordings were never officially released.